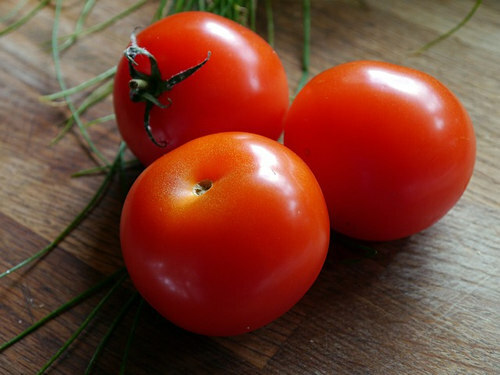 How to grow your own tomatoes … luscious, juicy tomatoes packed full of flavor! The best time of year to plant tomatoes will depend on what hemisphere that they will be grown in. It has to stay warm at night so that it does not freeze the plant because the frost will harm them. The tomato variety that is being grown (cherry tomatoes and heirloom varieties are popular choices) will also depend on when they can be planted. Some tomato plants do not take as long to grow as others. Some people will start seeds inside so that they can have tomatoes early in the growing season which is fine as long as there is good air circulation. Tomatoes can be grown on a patio in containers or they can be planted in a raised bed or traditional garden aswell – you can even grow upside down tomatoes. They will need a lot of sunlight though. So they will need to be placed in an area where they can get full sunlight. Close to buildings or trees would not be the best location for growing tomatoes as they many not ripen before the weather turns colder. There are still plenty of things that can be done with green tomatoes but I prefer that tomatoes ripen. 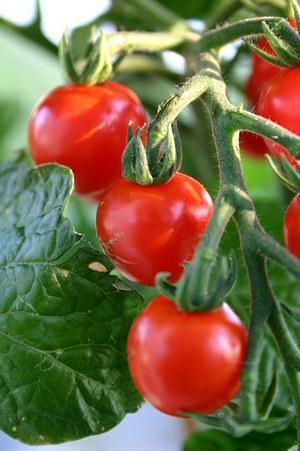 Tomatoes grow in many types of soil but they will do much better and produce fruit more if they have very fertile soil. If somebody is unsure what type of soil that they have, there are places that they can take it and have it tested. A fertilizer can also be used to give an extra boost for the plants. A fertilizer that is high in potassium and phosphorous and low in nitrogen will be good for the tomatoes. The perfect mixture of fertilizer will depend on the ground and what state these will be grown in. Some people do not use fertilizer and can grow them just fine. Whether planting from seeds or planting plants that have been started, it is good to use a tomato cage. These do not do much when the plant is small but can do wonders when it gets bigger and starts producing fruit. It will keep the plant up off of the ground along with the tomatoes. Giving these plants plenty of water is how to grow tomatoes larger. A tomato is approximately 95 percent water so watering them well helps them to grow bigger. It will also help to keep your plants healthy longer and give more growth to the tomatoes plant. The soil should not have have any water standing though. Too much water can also kill the plants. It can drown the plant. A tomato plant can be very sensitive to insects. One that is very common is called the tomato worm or tomato horned worm. These will eat the leaves and the fruit of the plant. Another common problem with tomatoes is called blossom end rot. When the fruit is almost ripe, it will rot. It can be very frustrating when this happens. This is why some people will use certain pesticides. There are organic ones that can be bought. There is also a way to make your own. It is also important to keep the weeds away so the tomato plants grow unobstructed. The weeds can take all of the moisture and the nutrients out of the ground and the plant will not get them. This can also take away from how many tomatoes that will be harvested from each plant. Many people have their own opinion on tomato growing. Each one will be a little different. Some people will also use a hydroponics system to grow them.